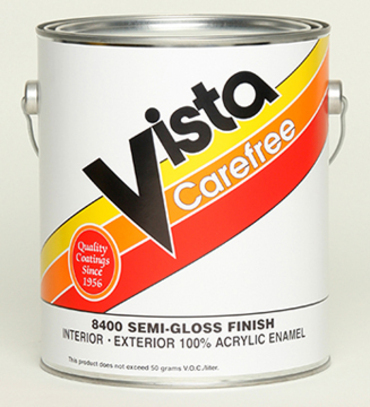 Carefree Semi-Gloss is a premium plus 100% acrylic enamel for interior and exterior surfaces. This top-of-the-line enamel provides block resistance with excellent scrubbability and durability and is formulated to withstand moderate to severe weather conditions. Excellent choice for use in food and beverage areas, restrooms, doors, trim and exterior substrates where a superior semi-gloss finish is desired. NOT FOR USE ON FOOD CONTACT SURFACES. Carefree can be used in areas where oil based products were previously required. NOTE: This product contains ingredients which resist the growth of mircrobes on the surface of the paint film. Recommended Uses: Properly primed drywall, concrete, masonry, wood and metal. Colors: White, stock and custom colors to order.